During a recent flying qualities flight test in an A-36 equipped with tip tanks, I experienced a partial aileron blockage. The dual yoke would center and turn to the right but not to the left, i.e., it would not turn to the left past center. During these tests, among other things we measure the roll rate of the aircraft. This is accomplished by establishing a steady level turn with a 30 degree bank angle to either the left or right and then, upon the pilot's mark, starting a stopwatch as the pilot rapidly turns the centered yoke through its full, left or right, 106 degrees of travel. As the AI passes through 30 degrees of bank in the opposite direction the pilot again calls mark, and the stopwatch is stopped. Experience shows that three tries gives a consistent average. No, it is not as aggressive as it sounds. We have done dozens of these tests in this particular aircraft. 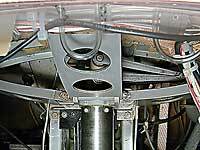 On the flight in question, at an indicated airspeed of 116 knots, three right to left rolls with the gear extended and flaps retracted, followed by two right to left rolls with the gear and flaps retracted, i.e., clean, were successfully conducted. Because the aircraft rolls more quickly in one direction, the third roll in the clean configuration was from left to right to demonstrate this effect. Upon completion of the left to right roll, in leveling the aircraft I noticed that the yoke would not turn to the left past center. Gentle tests indicated that yes, indeed, the yoke and/or aileron was blocked. Further gentle tests showed that the elevators and rudders worked, and that left rudder would roll the aircraft to the left as expected. Thus, some left roll control was available. At this point I had a flyable aircraft configuration, take-off less than an hour ago was in light and variable winds, the airport was within ten miles and I was currently at 3000+ feet positioned for a straight in landing on the duty runway. Time to go home. The gear was extended at 1200 feet AGL and two miles from the runway. A no flap landing with a 3-5 knot crosswind was accomplished without incident. In applying left brake to turn off the runway initial resistence was encountered, but some additional pressure resulted in a soft popping noise and no further resistence. 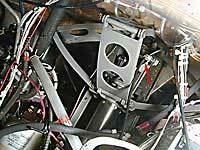 After shutdown, full travel of the yoke and ailerons was available. Right, I imagined it all! No way! My first thought was that the aileron cable had jammed between one of the pulleys or that the cable had frayed such that movement in one direction was possible and not the other. 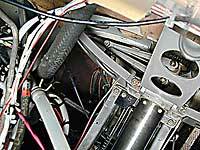 Alternatively, because of the resistence when applying the left brake, the aileron-rudder interconnect was damaged. The decision was made to fully inspect all the aileron cables and the aileron-rudder interconnect before further flight. The aircraft was left with the mechanic. Further reflection (semi-sleepless night) led me to believe that a jammed or partially jammed aileron cable would not account for the observed behavior. The next morning, tests on our laboratory demonstration T-34, from which we had partially removed the skin on one wing to reveal the control system, confirmed that a jammed aileron cable would simply not allow the yoke to rotate at all. Thus, the jam probably occurred within the control mechanism, or something under the glare shield was interfering with movement of the controls. Perhaps something had broken within the yoke system, fallen down and jammed in the chain and sprocket that transmitted the rotation of the yoke to the control cables or alternatively something had come adrift under the glare shield and was jamming the controls. 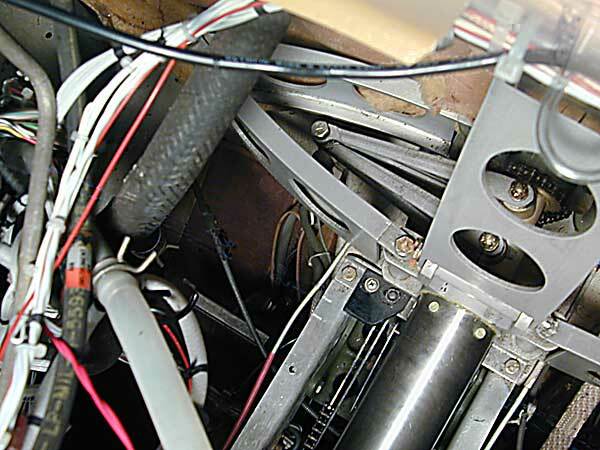 A call to the mechanic revealed that all the aileron cables, as well as the aileron-rudder interconnect, had been inspected and nothing found. 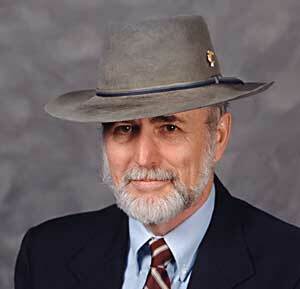 He and I had been thinking along the same lines. 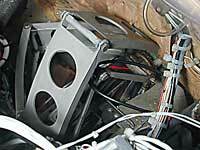 We decided to pull the glare shield and if nothing was found, to then inspect the internals of the control system. Figure 1. The control column is full forward and the yoke centered. 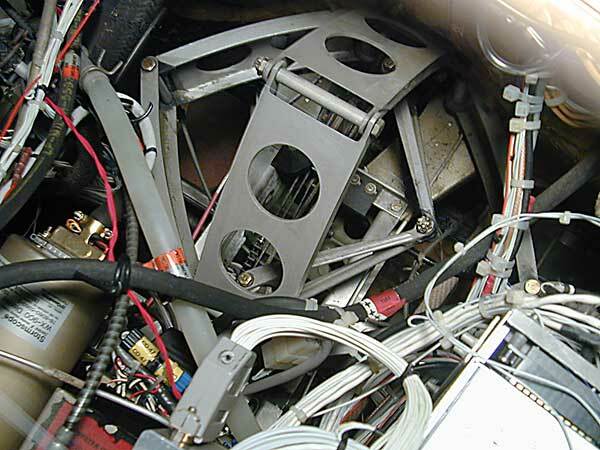 Figure 1 shows the vertical and horizontal elevator scissors (black arrows) with the control column all the way forward toward the engine compartment and the yoke centered. Notice that the elevator scissors are pushed together. In this position they have the largest vertical and horizontal length within the `avionics' bay. 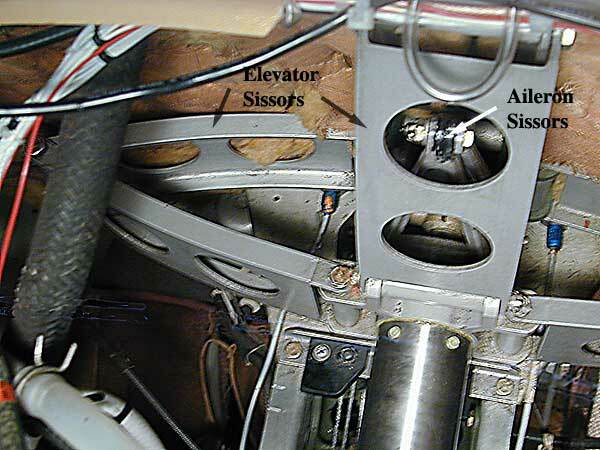 Just behind the upper hole in the vertical elevator scissors is the end of the aileron scissors (white arrow). 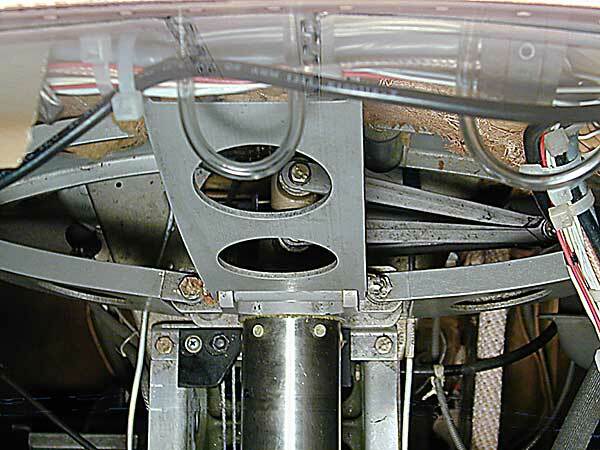 In this position it lies between the two parts of the vertical elevator scissors. 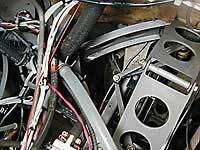 Here the bolt holding the the two parts of the aileron scissors together passes from right to left. Notice the castellated nut and cotter key on the left side of the bolt. Figure 2. The control column is full forward and the yoke full left. Figure 2 shows the control column all the way forward and the yoke rotated all the way to the left (106 degrees). 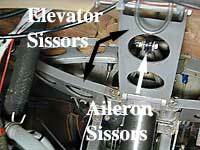 Notice that the aileron scissors now lies between the left horizontal elevator scissors after rotating from the vertical position in Figure 1 through 90 degrees to the current position. Figure 3. The control column is full forward and the yoke full right. Similarly, Figure 3 shows the control column all the way forward and the yoke rotated all the way to the right (106 degrees). Thus, to get from the position shown in Figure 2 to that in Figure 3, the aileron scissors rotates through 180 degrees and passes between the arms of the vertical elevator scissors. Figure 4. Column full aft and yoke full right. Figure 5. Column full aft and yoke full left. Figure 4 shows the control column all the way aft and the yoke rotated all the way to the right, while Figure 5 shows the column all the way aft and the yoke rotated all the way to the left. In normal flight the control column is positioned between these two extremes. Figure 6. 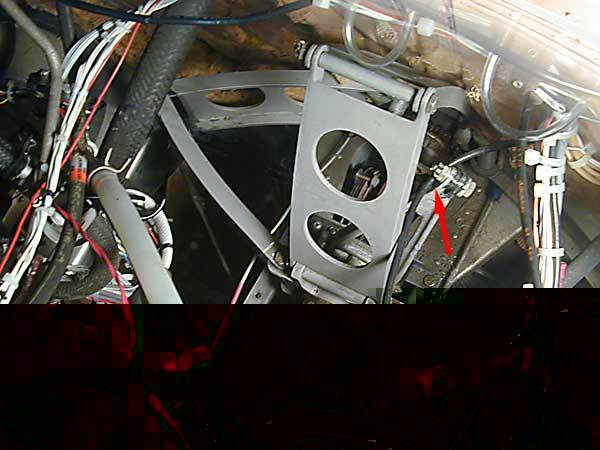 Simulated sagging cable jamming the yoke and preventing left aileron movement. 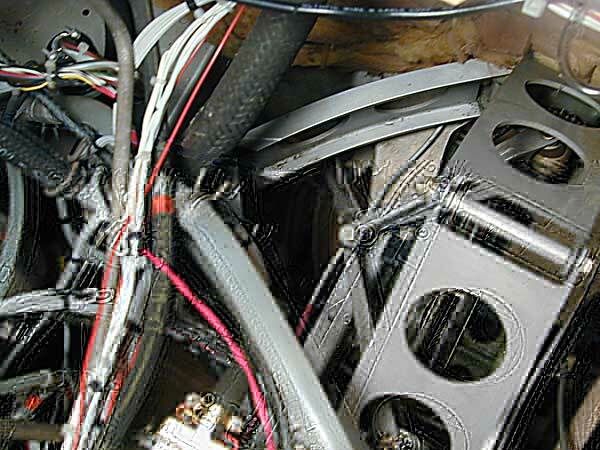 If a wire, hose or cable comes adrift in flight, then it can become jammed between the aileron scissors and the elevator scissors and prevent the aileron scissors from moving past the center position. Considering that the castellated nut and cotter key projects from the left side of the aileron scissors, it is more likely that the wire, hose or cable will hangup on the left side of the aileron scissors and prevent the yoke from rotating to the left past center. This is shown (simulated) in Figure 6, where a fore and aft cable has sagged and is jammed between the aileron scissors and the elevator scissors behind the castellated nut (red arrow). Figure 7. Simulated cable loop jamming the yoke and preventing left aileron movement. Figure 7 shows a loop of cable that has detached and fallen behind and is looped over the aileron scissors and caught under the castellated nut (red arrow). The other end is held by cable ties. Notice that the loop prevents movement of the yoke to the left but will allow movement to the right. This is what happened in the incident to hand. Considering that cable ties age and break and that many avionics technicians do not understand the control system in the Bonanza - it is rather unique after all - this incident suggests that at your next annual (or sooner) and any time you have avionics work done, you should request that the glare shield be pulled (or left open) so that you can inspect the position and condition of all hoses, cable ties and wire bundles.